Using a knife, spread the donut holes with the Betty Crocker™ Whipped Fluffy White Frosting, covering them completely. Place 2 cups of the Cinnamon Toast Crunch™ cereal in a food processor or plastic zipper bag. Crush into fine crumbs and roll frosted donut holes in the crushed cereal. Vanilla frosting and Cinnamon Toast Crunch™ cereal turn plain donut holes into breakfast treats. Let’s face it: Donuts are just about the best food ever. EVER. And to actually get to start the day off with one of these delicious treats, well, it just makes you feel like you are winning at life. But every now and then the plain ol’ donut hole needs a little sprucing up, you know? A little extra somethin’ somethin’ to get you going in the morning. So I combined my two favorite breakfast foods together. Yup. Donuts + Cereal = Love. And these are super duper easy to make, so grab some plain donut holes, Betty Crocker™ White Whipped Frosting (this kind is my favorite and I’ll explain in a minute) and some Cinnamon Toast Crunch™ Cereal. First, scoop out a generous amount of frosting with your knife. Now is not the time to be frosting shy. Slather the creamy frosting goodness all over the donut hole until it’s completely covered. Yes, you will get frosting on your fingers—but licking frosting off of your fingers is not a bad thing. Now crush up the Cinnamon Toast Crunch™ cereal with a food processor, or go old school with a zipper bag and rolling pin. Roll the frosting-covered donut in the crushed cereal. And the reason why I use Betty Crocker™ White Whipped Frosting? It’s because when you combine it with the donut and crushed cereal, it tastes like milk. I KNOW, RIGHT? Donuts and milk, cereal and milk. Betty Crocker™ White Whipped frosting is the PERFECT substitution for milk. Who knew? There you go. 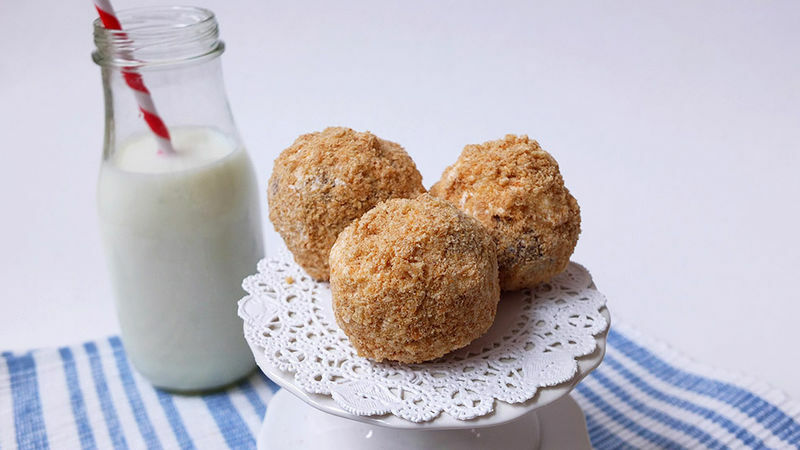 Cinnamon Toast Crunch™ Donut Holes. I can’t think of a better way to start my day!